There are four main time periods in Ancient Egyptian History: Predynastic, Old Kingdom, Middle Kingdom, and New Kingdom. The Predynastic period (3500-3100 BC) ended when the Upper and Lower Egyptian areas unified under the first Pharaoh, Narmer. The Old Kingdom (2686-2181 BC) was an extremely prosperous time that allowed the Pharaoh’s to build pyramids. Then came the Middle Kingdom (2055-1650 BC) which was the peak for the time of the Pharaoh. The last major period was the New Kingdom (1550-1069 BC) that was the last prosperous period that died with Rameses III. Egypt continued to have its own land, but soon, the Persians, Alexander the Great, and then Augustus Caesar would have their turns battling for the land, until it became a part of the Holy Roman Empire. Art is an important intermediary between the living and the dead in Egyptian culture. Artists in Egypt, as well as in pre-historic times, were powerful people. The artists were servants with the pharaoh. They made pictures of hunting, boats, cooking, daily life and death. Egyptians are the first society to create art largely based on the human form. Remember that the style is directly connected to the communication of the art. Generally, the way artists communicate changes quickly as time goes on. For example, Impressionism was popular for some forty years until the style shifted. The Egyptians kept the same unifying style for over 3,000 years. How could that ever have been done? A scale or template was mathematically developed to dictate to the artist the way art was to be created. This template was developed to keep order and consistency in the empire‘s art and architecture. A grid was placed onto the wall before the painting or carving of a wall began. A drawing of the figure was then placed over the grid before that design was produced on to the wall. Egyptians are also well known for their sculptures. Teams of the most skilled sculptors created temple decorations, monuments, and likeness of their Pharaoh. Using a scaffolding system, they chiseled, sanded and polished stone into a work of art. Much of this same process used to carve stone was applied to wooden works including; coffins, statues, furniture, boats, and many other utilitarian works. Other works, sculpted from metals like gold and copper, were not only great works held in high esteem by the Pharaoh, but at times, also served as tools like chisels, builders squares, and levels. One of the first major immolators of the art of ceramics were the Egyptians. Nile River clay was used to hand build many pots, vessels, and sculptures. Later, between 2494 and 2345 BC, they developed a potters wheel that helped create symmetrical works. These works were functional in their daily lives to prepare, serve, and store food and liquids. To better color and decorate their wares, the Egyptians invented glazes. Mummification is as identified with Egyptian culture as the pyramids. The four step process of making mummies is an interesting one. First, the embalming priest takes the identity of Anubis, the jackal faced overseer of the grave and manager of souls, as he removes the brain and organs. These important organs are dried, wrapped, and placed into canopic jars to be overseen by the four Sons of Horus: Imsety the human who looks over the liver, Duamutef the jackal who looks after the stomach, Hapy the ape who looks after the lungs, and Qebehsenuef the falcon who looks after the intestines. The second step in this process is to dry the body with salt. Over a number of days the body, on a specially designed table that helps bodily fluid runoff, is dried under a large amount of salt. The body is stuffed with linen, salt, sawdust, and spices. The third step is for the body to be wrapped in linen bandages. As much as four thousand square feet of linen was used in this process. Protective charms and jewels are placed between the layers of the linen. The final step for the mummified remains is for a mask to be placed on the dead and the dear is placed into one or more coffins and sarcophagi. Although we may think of the elaborate gold masks, it was more common for those to be more simple planks of wood with the person's face painted onto the plank. The coffin, or as many as three, are placed into the sarcophagus, which is generally a stone box that holds the coffins. One of the most important of the Old Kingdom’s third dynasty pharaohs was Zoser (sometimes spelled Djoser). He ruled at a time of prosperity in Egypt from 2667-2648 BC. Because the society could economically afford to spend time, funds, and energy on larger projects, Zoser was more than willing to approve such projects. As Pharaoh of Egypt, he wanted to showoff his wealth and power by building himself an impressive ziggurat-like tomb at Saqqara. The building supervisor for this "Stepped Pyrimid" was Imhotep. Imhotep was very powerful in this society. He worked and was educated as an architect, doctor, high priest, scribe, poet, astrologer, and the founder of a healing cult. With his power and knowledge, Imhotep’s legacy would last for centuries, eventually building up to his being seen as a god. But the recognition that went to Zoser is an interesting part of the story. Artists at this time did not sign artwork because it was thought that the artist would take the privileges of the dead Pharaoh. But in Zoser's Tomb, Imhotep is given credit for the design of the tomb, largely due to his high standing in the society. This exceptional distinction gives Imhotep the label as history’s first known artist. This structure was designed twice because the first plan was not grand enough for Zoser's illustrious opinion of himself. The final six-stepped pyramid was a giant compared to all other royal tombs before it. It is 459 feet long, 387 feet wide, and nearly 197 feet high. This is an impressive scale considering that the Egyptians had limited knowledge of technologies and limited materials. In this construction, Imhotep was the first to move from mud to stone as the main building material. He then cased the stone in a limestone shell. The Pyramid was a simple geometric shape that Imhotep selected and the builders had the knowledge to build it. There was also a religious connection with the shape through the hieroglyphs of Ra and a relationship with the sun. The Pyramid is the center of a large complex that is protected by a 30-foot wall. The complex includes courtyards, temples, and other structures used for religious purposes. The burial chambers are underground, and were hidden in a maze of tunnels to discourage grave robbers. The maze did not work in deterring these robbers, however. All that currently remains of Zoser and all of his empire is an empty tomb and a single mummified foot. One of the great Pharaohs of the Old Kingdom was Khufu, who lived 2589-2566 BC. Although considered a great and wise Pharaoh in Egypt, the most lasting part of his twenty-three year reign is his pyramid, also known as the Great Pyramid. A student in my class would be wise to know several features of this pyramid, of which there are many. It was designed to be the largest tomb built in all the world (that was known). 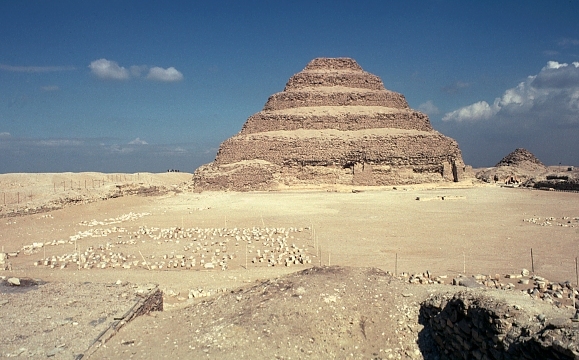 The Pharaoh, his family, servants, and government officials were all buried in the complex around this pyramid. This single structure is 482 feet high. It was not until 1880, that another structure exceeded it in height (the Cologne Cathedral in Germany). At its base, the pyramid covers thirteen acres square. There are over two million blocks in its construction, weighing 4500 pounds each. That’s over five million tons of limestone. A cantilever crane and other lifting devises were probably used to move the very large stones into place. With this volume of blocks to lift into place, and keeping in mind that it took twenty three years to build, a stone had to be set in place on an average of every five minutes. That is heavy work done fast! We also should remember that the Egyptians had no knowledge of the wheel at this point of their history either. This pyramid is also known for its false chambers, a gold top beacon, and it was originally cased in a smooth white limestone. It is considered to be the largest stone building ever to have been built. However, there is current exploration of a newly discovered pyramid near San Bartolo, Guatemala that might top the massive Great Pyramid in Egypt. Regardless, we cannot take away from the impressiveness of Khufu’s Pyramid. It was so impressive of a structure that historians Herodotus and Callimachus listed this “Great Pyramid of Giza” as one of the original Seven Wonders of the World. Of those seven, the Great Pyramid is the only one that still stands today. When Khufu died, his body was placed in the red granite tomb chamber within a red granite sarcophagus. After the entombment, the pharaohs tomb was sealed with three stone slabs to act as trapdoors. This did not stop the tomb from being plundered. At some point, the riches of Khufu were stolen along with his mummy. In all likelihood, all of the riches of Khufu are lost for all time. As the middle Kingdom approached, the pharaohs lost power to local leadership. This also caused a divide between the upper and lower regions in Egypt. 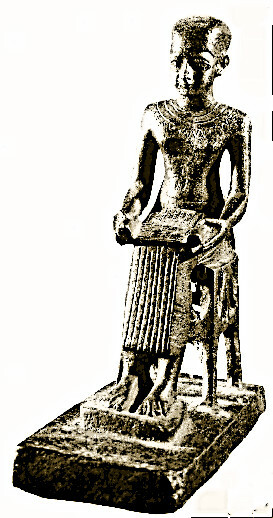 The region was reunited under Mentuhotep II, who ruled from 2055-2004 BC, after crushing his enemies. Although now united, Egypt fell into a poor economic state and small pyramids had to be made to conserve funds. Soon, tombs were built into the sides of cliffs. Support colonnades, or rows of columns, were carved from the solid rock of the cliff. Egypt began to war with the Hyksos (Turkey). The warriors of Hykso had advanced weapons and horses. Egypt was defeated. The Egyptians learned how to use these newly discovered weapons and soon became skilled with the new war technology. Egypt retook its land. This began the New Kingdom. The last great warrior pharaoh was Rameses II. Demonstrating great military, political, and economic power for sixty-six years, Rameses II earned his nickname, Rameses the Great. With his military knowledge, he was successful on several campaigns, but that time would come to an end. Soon the "Sea People," the predecessors of the Greeks and Turks, attempted to settle in Egypt. They were stopped by Rameses III, but with pending attacks by the Libyans, Assyrians, Nubians, and Persians severely weakened Egypt. The next attack on Egypt would break the country. In 333 BC Alexander the Great begins to battle in Egypt. The following year, in 332 BC, Alexander the Great conquered Egypt. To legitimize his power, Alexander the Great was named Pharaoh of Egypt. He soon died leaving the region in the power of the Macedonian empire, but the region was soon divided into several kingdoms. The last ruler of ancient Egypt was the queen, Cleopatra. Always loyal to Egypt’s independence, she went as far as having a relationship with Julius Caesar to keep Egypt independent. After Caesar’s assassination, the governing of Egypt was shared between Cleopatra and Mark Antony, who would soon get married. Octavian Caesar saw this as treason against Rome, so he waged war against Antony and Cleopatra. Fearing immanent death when captured, Antony commits suicide, an act soon followed by Cleopatra in 32 BC. Her death marks the end of the of pharaoh rule in Egypt and the start of Egypt’s role as a part of the Roman Empire.